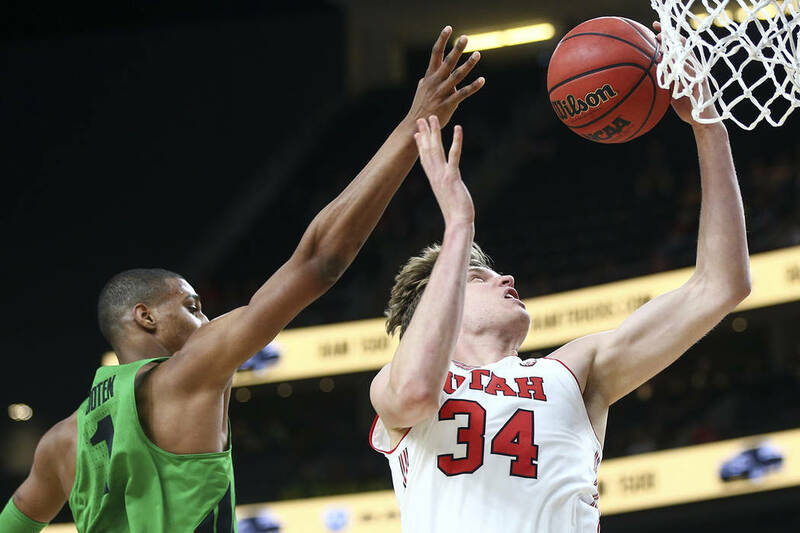 #VegasMadness updates: The Madness is truly getting underway in Las Vegas as the Mountain West, Western Athletic and Pac-12 conference tournaments have started. Review-Journal reporters are on-scene for all of it. 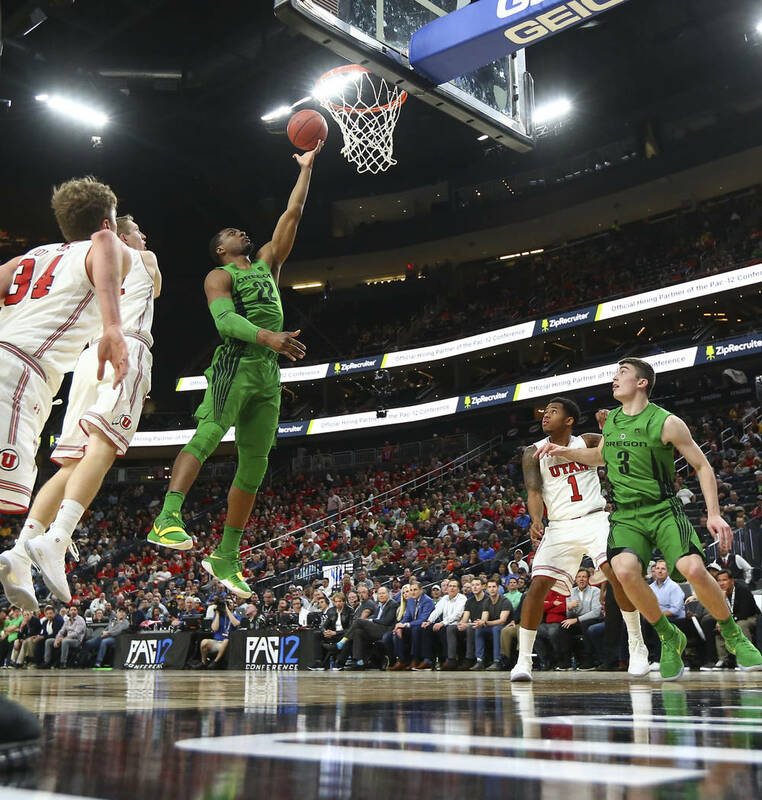 For the second straight game, Kenny Wooten had a game-saving block as Oregon held on to defeat Utah 68-66 in a back-and-forth quarterfinal battle. The Ducks move on to play Southern California in Friday’s late semifinal game at T-Mobile Arena. UCLA and Arizona will battle in the first semifinal. Wooten blocked Sedrick Barefield’s layup as time expired. 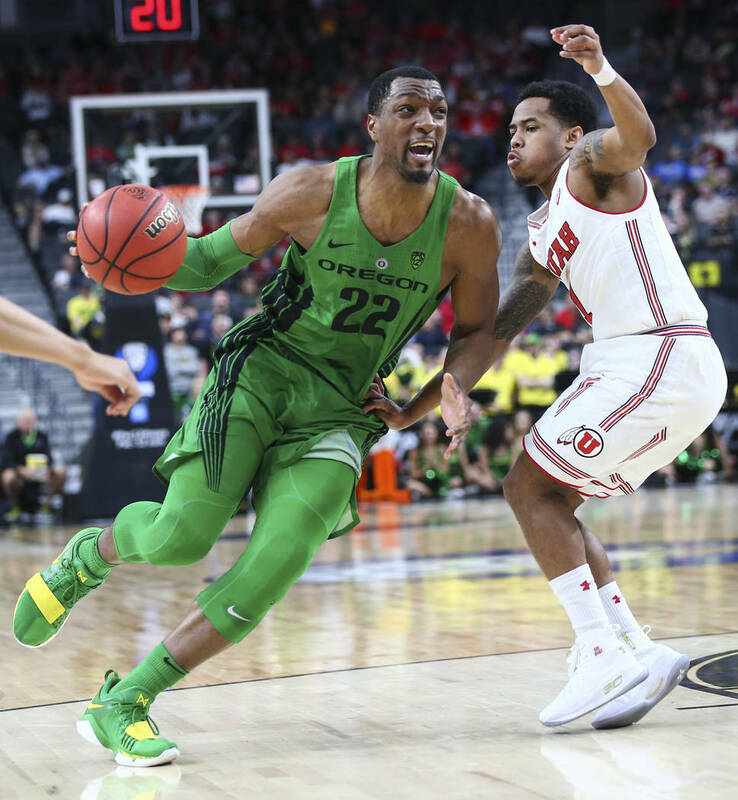 The Oregon freshman had key blocks in Wednesday’s victory against Washington State. 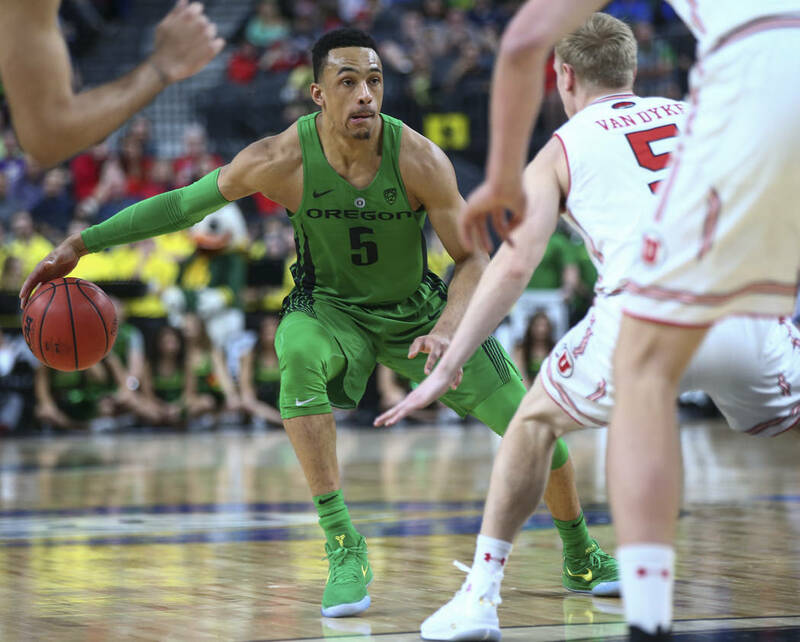 Elijah Brown, the former New Mexico guard, scored 21 points for Oregon. 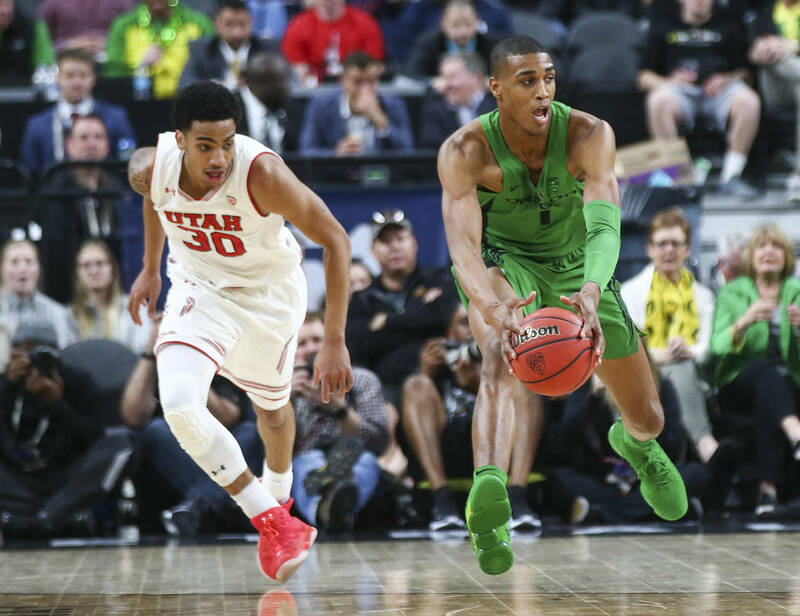 Las Vegan Troy Brown had four points for the Ducks. Joe Furstinger scored 23 points to lead No. 3 New Mexico to an 85-75 victory over No. 6 Wyoming in the Mountain West men’s quarterfinals at the Thomas & Mack Center. The Lobos (18-14) will face No. 7 Utah State (17-16) in the semifinals at 8:30 p.m Friday. The Aggies upset second-seeded Boise State 78-75 earlier Thursday. In other semifinal, top-seeded and 22nd-ranked UNR (27-6) meets No. 5 San Diego State (20-10) at 6 p.m.
Wyoming, which was led by Alan Herndon’s 19 points, is 20-13. 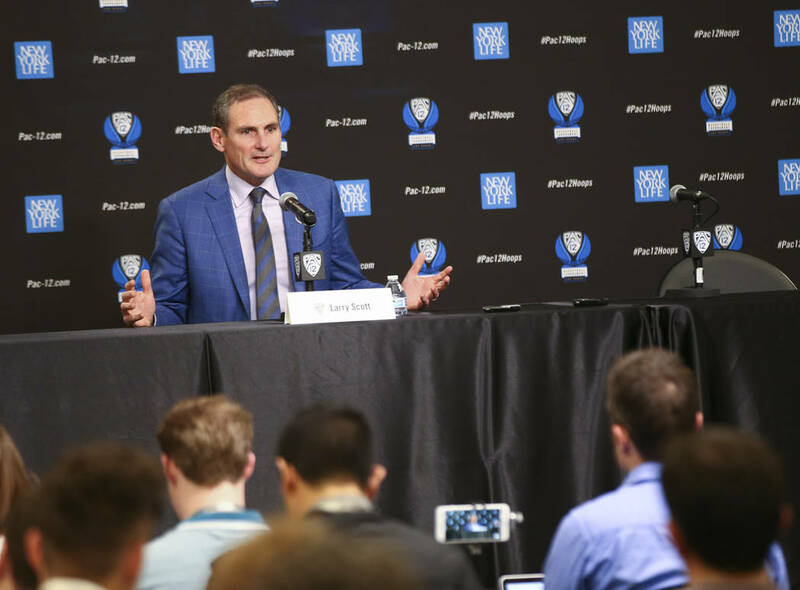 Boise State coach Leon Rice was asked several times about his team making another early exit from the Mountain West Tournament after his second-seeded Broncos lost in the quarterfinals for the third straight year. Rice had a very unique perspective on his team’s postseason flameouts in Las Vegas. 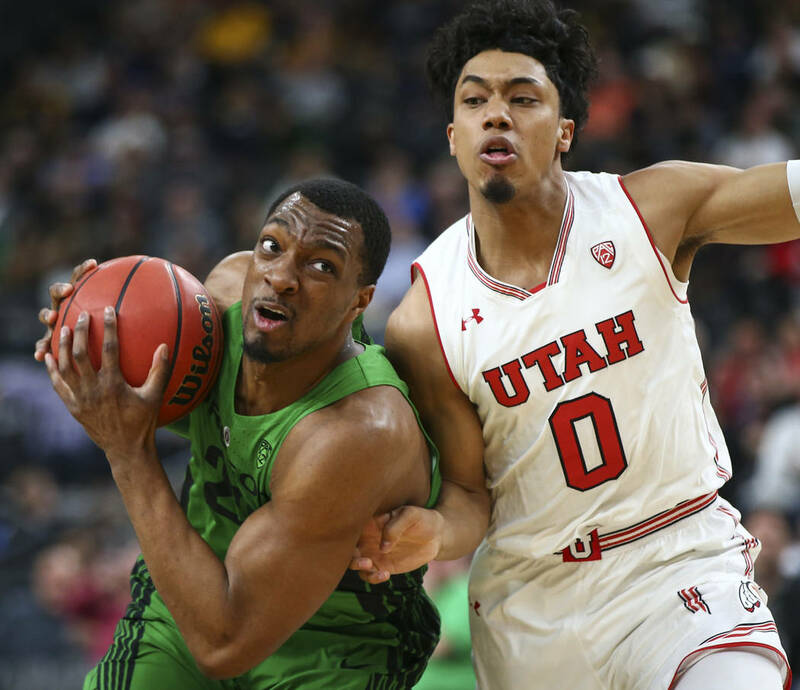 “Might be we overachieved during the season,” he said after the 78-75 loss to seventh-seeded Utah State. Rice’s theory appears to be that all the teams in the league are very similar in ability and his team shouldn’t be looked down upon for losing each year as a better seed. Maybe they create high expectations by playing above their heads in the regular season. Rice’s team will be sitting by the phone Sunday hoping for a call from NIT officials. Hopefully for their sake they will be seeded properly so as not to create unrealistic expectations. 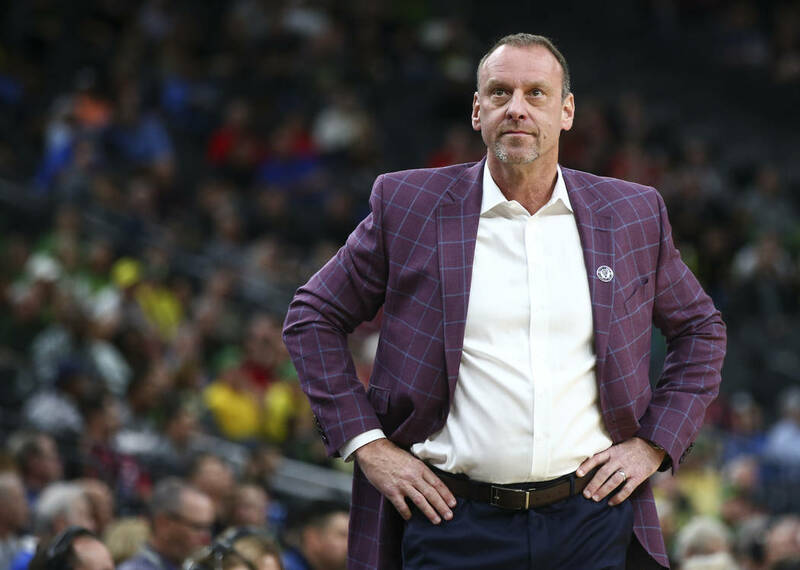 Boise State’s 78-75 loss to Utah State at the Thomas & Mack Center was the Broncos’ third defeat in a row in the Mountain West men’s quarterfinals. Broncos coach Leon Rice was asked afterward if the program had experienced “slow growth,” and he didn’t take kindly to the question. “I don’t know, I don’t see that. I don’t get that. We’ve been the most consistent team in the league the last four years. We finished in the top three the last four years. You’re talking about San Diego State, UNLV and New Mexico. I don’t understand where the slow growth is talking about. “We went from the WAC to contending. We won the Mountain West. We contended for a title four years. And so I don’t get what — I think it’s ignorant to say ‘slow growth.’ You’re talking about a UNLV program that has won a national championship, a national championship. You’re talking about a San Diego State team that’s 18 straight years of being terrific, talented, toughest places to play in this league. “Slow growth is — we’re selling out Taco Bell Arena. We’re 15-1 at home and on and on and on. We’re putting a guy in the (NBA) draft this year. So ‘slow growth’ may be the most ridiculous term I ever heard from anybody about the basketball program and where we are. And you don’t measure a program by a three-day tournament. You measure it by how it does in the league every year, because that’s over the course of three months. And that’s night in, night out, for three months. 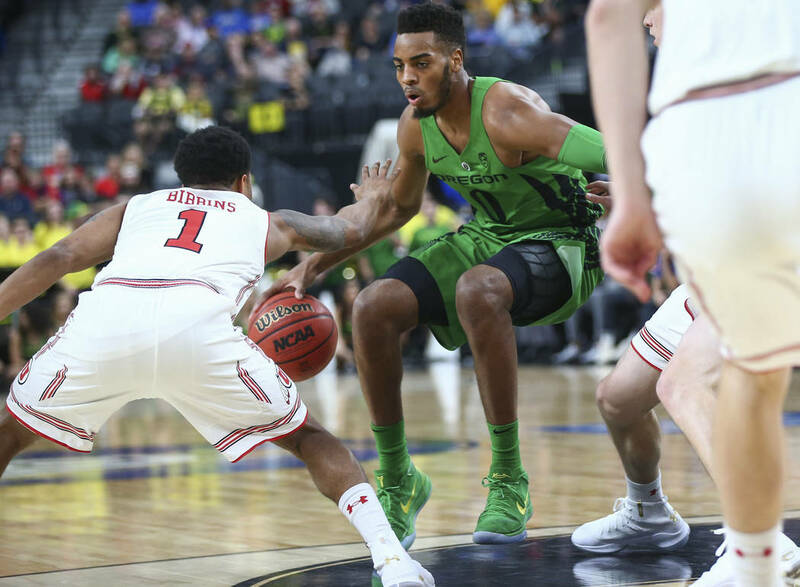 Las Vegas native and Oregon swingman Troy Brown was held to just eight points in his first game in front of his hometown fans on Wednesday. His second game isn’t going much better. 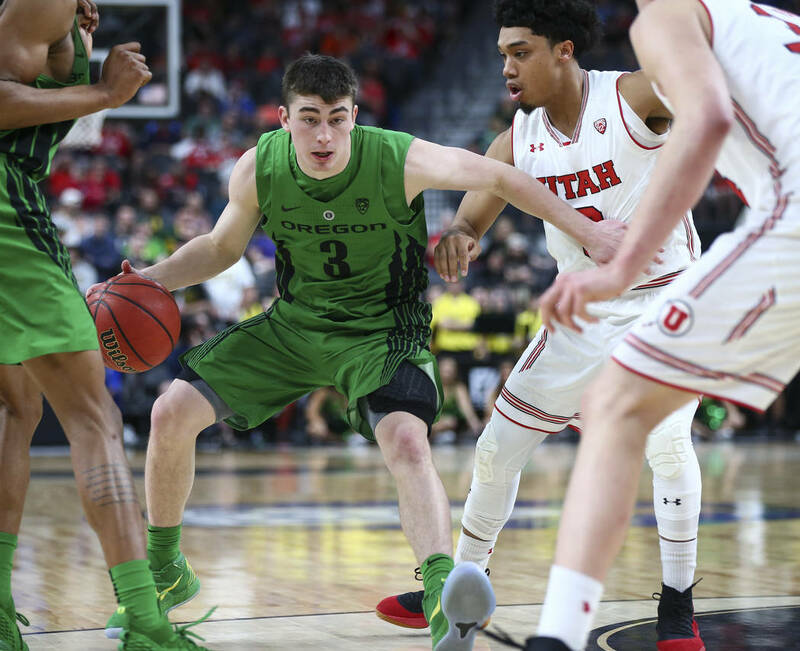 Brown, a Centennial graduate, picked up two fouls in the first 7:22 of the Ducks’ quarterfinal game against Utah in the Pac-12 tournament and was sent to the bench scoreless. He’s missed his only shot so far. 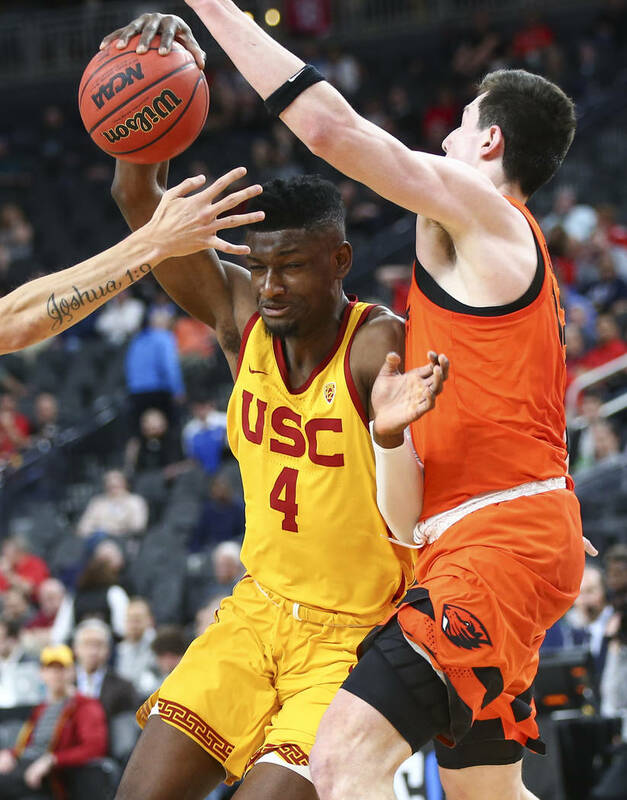 Chimezie Metu scored a game-high 22 points to send Southern California to the Pac-12 semifinals after the Trojans defeated Oregon State 61-48. 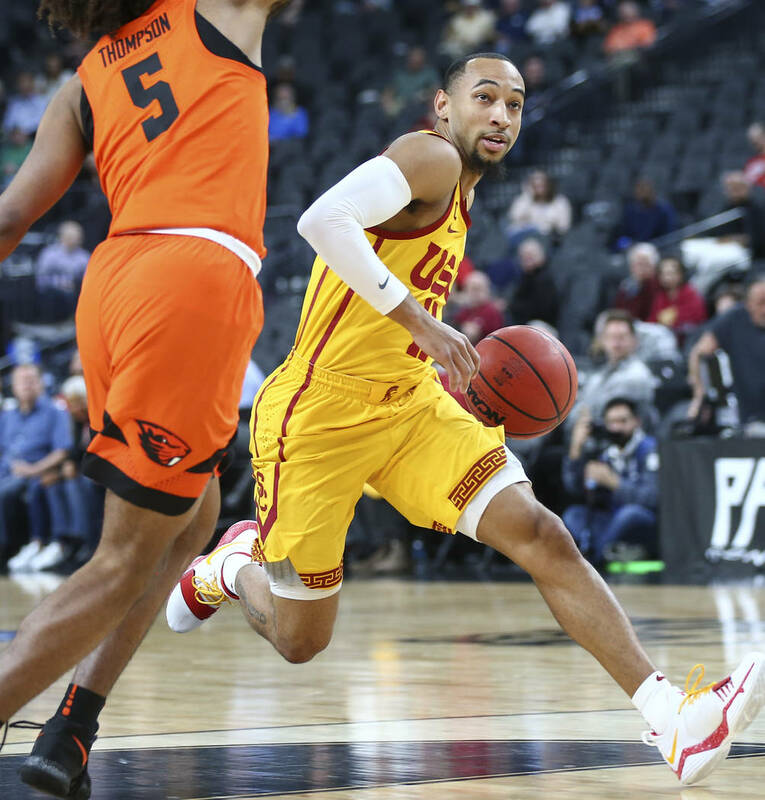 USC will play the winner of tonight’s Oregon-Utah game. 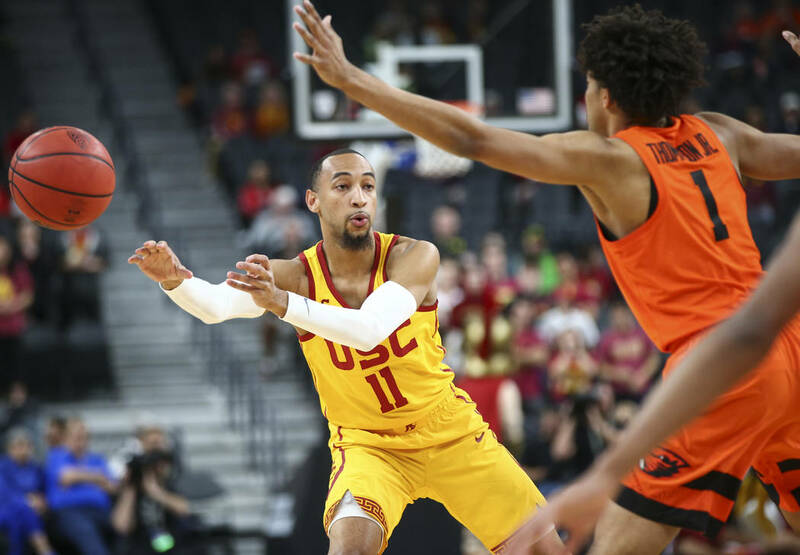 The Trojans never trailed and led by as much as 15 points. 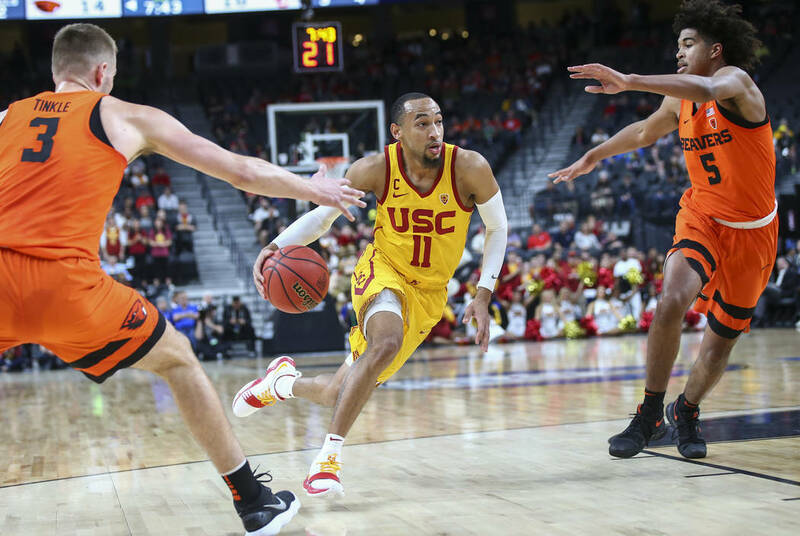 Bishop Gorman High graduate Chuck O’Bannon didn’t see the floor for the Trojans. He’s played in 13 games during his freshman season. No. 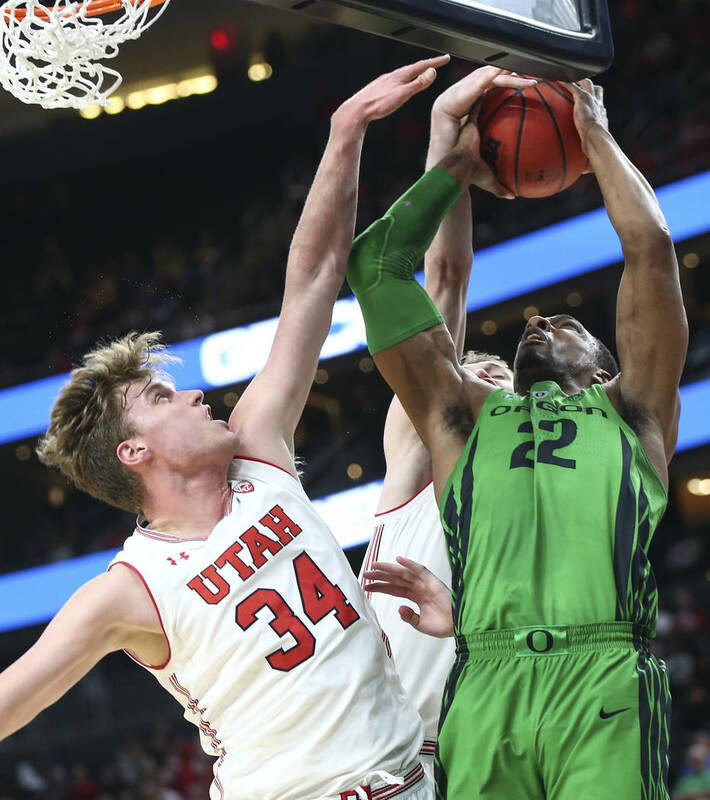 2 seeded Boise State got the ball in its top player’s hands, but Chandler Hutchison missed a 3-pointer with a second left, and Utah State pulled off a 78-75 upset Mountain West tournament men’s quarterfinal victory. The No. 7 Aggies (17-16) took the lead for good at 74-73 on a free throw by Dwayne Brown Jr. with 57 seconds left at the Thomas & Mack Center. Teammate Sam Merrill made a 3-pointer with 31 seconds remaining for a 77-73 lead. 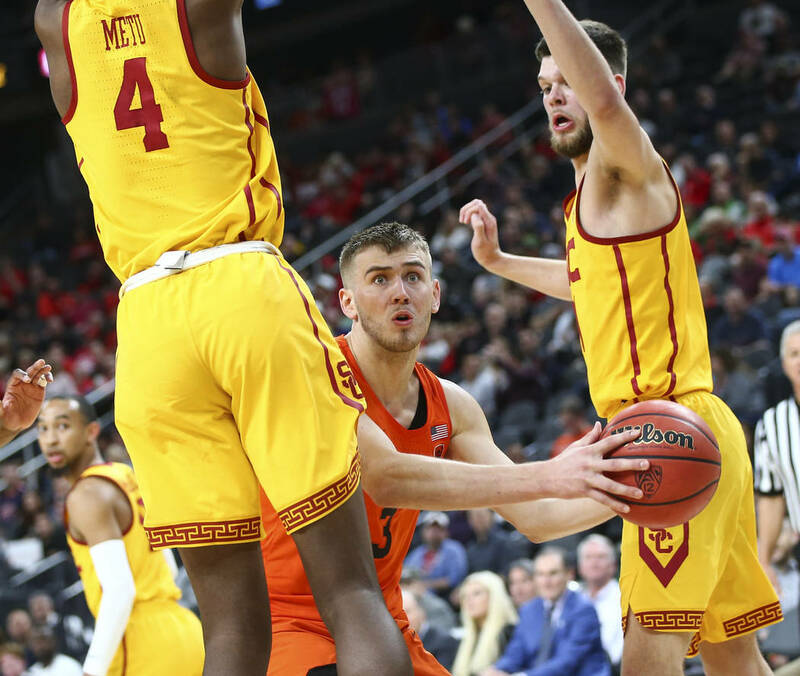 Koby McEwen had a chance to clinch the game for the Broncos, up two points with seven seconds to go, but missed a free throw before making one. That set up Hutchison’s last attempt, which bounced off the rim. Merrill made 7 of 10 3-pointers and scored 28 points for Utah State. Lexus Williams scored 24 for Boise State (23-8). 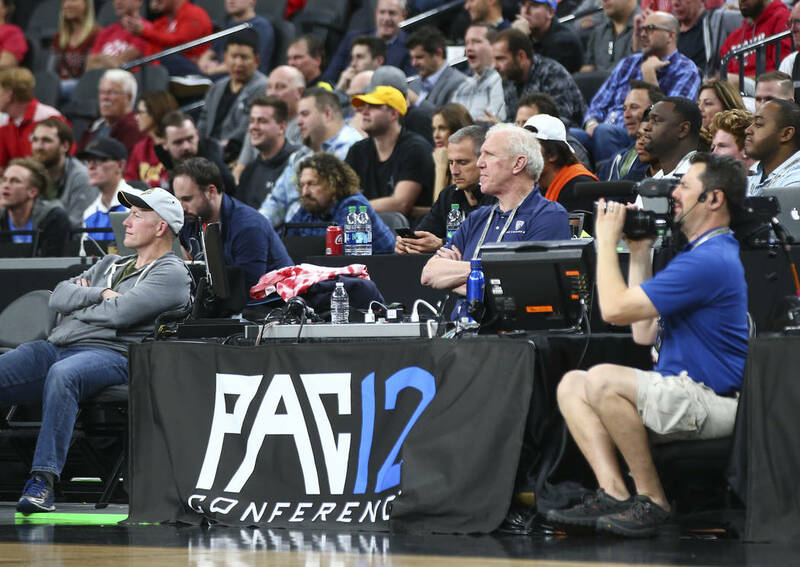 Over at T-Mobile Arena, basketball hall of famer Bill Walton is serving as analyst during early night game for the Pac-12 Network. Then again, there really is no need for famed the NBA title-winner/UCLA champion/public speaker/Grateful Dead fan to have a play-by-play guy beside him. He can talk. And talk. And talk. Without much prompting. And he knows this and talks about it. I know this first-hand from hosting the Best of Nevada Preps banquet two years ago, when Walton was the guest speaker. Walton was scheduled to talk for 30 minutes. Then I crept up the stage, step by step, five minutes per step. When Walton saw me, he knew his time was done, but he took another 10 minutes to wrap up his speech. There were all very good words of wisdom for high school kids. But can he talk. Which is why he’s in the perfect job as analyst, talking basketball and whatever tangent hits him. Six games between the women’s and men’s WAC Tournaments so. Six victories for top seeds. No. 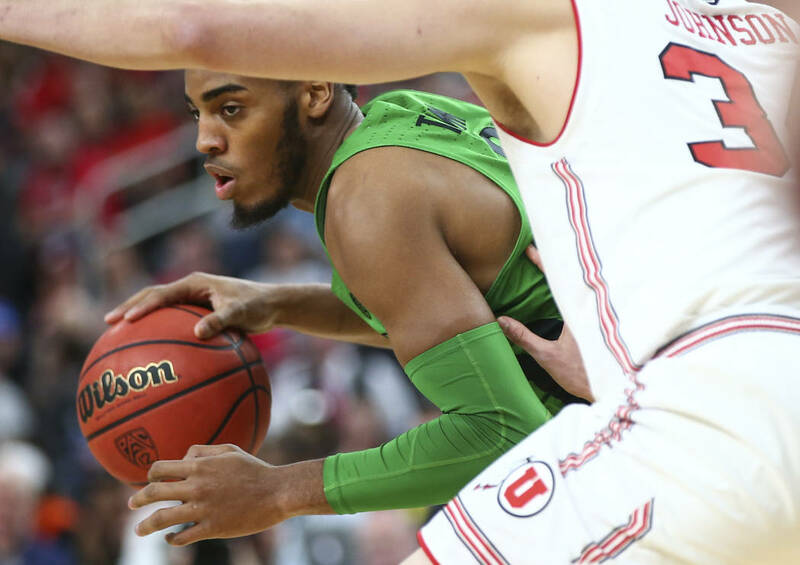 2 Utah Valley nabbed an 81-74 victory over No. 7 seed Cal State-Bakersfield to conclude the early portion of the men’s quartefinals. The top four seeds all prevailed in the women’s draw Wednesday. Top-seeded New Mexico State is playing No. 8 seed Chicago State, and No. 4 Seattle plays No. 5 Texas-Rio Grande Valley in the nightcap. 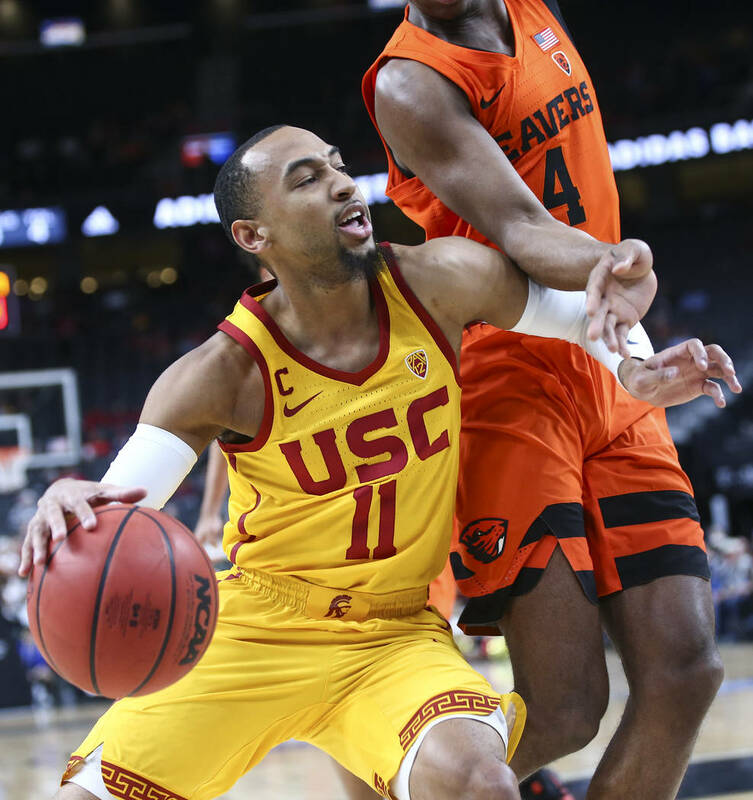 One of the great Southern California passing combinations to have never existed is on hand to watch the Trojans play Oregon State in the Pac-12 tournament. USC athletic director Lynn Swann, a college All American in 1973, was talking pregame with former Trojans quarterback and 2004 Heisman Trophy winner Matt Leinart. Swann had the better pro career of the two, winning four Super Bowls with the Pittsburgh Steelers and reaching the NFL’s Hall of Fame. Leinart was drafted 10th overall by the Arizona Cardinals in 2006 but only threw 644 career passes. 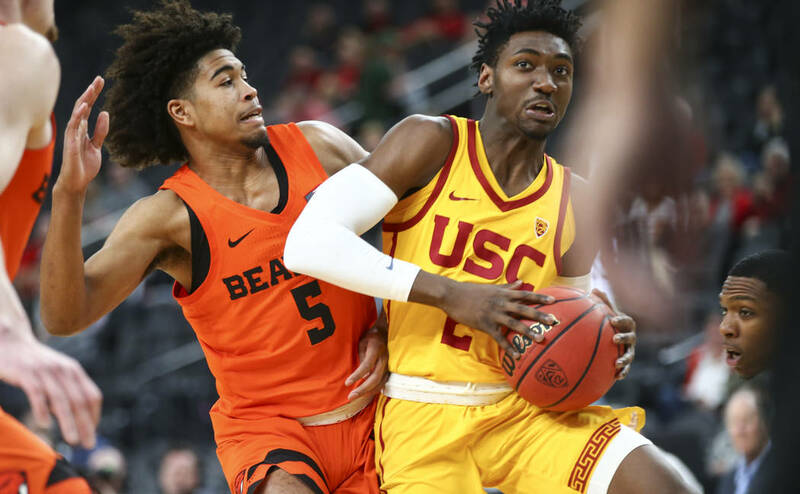 Aaron Holiday scored 34 points to lead UCLA to a 88-77 victory against Stanford. 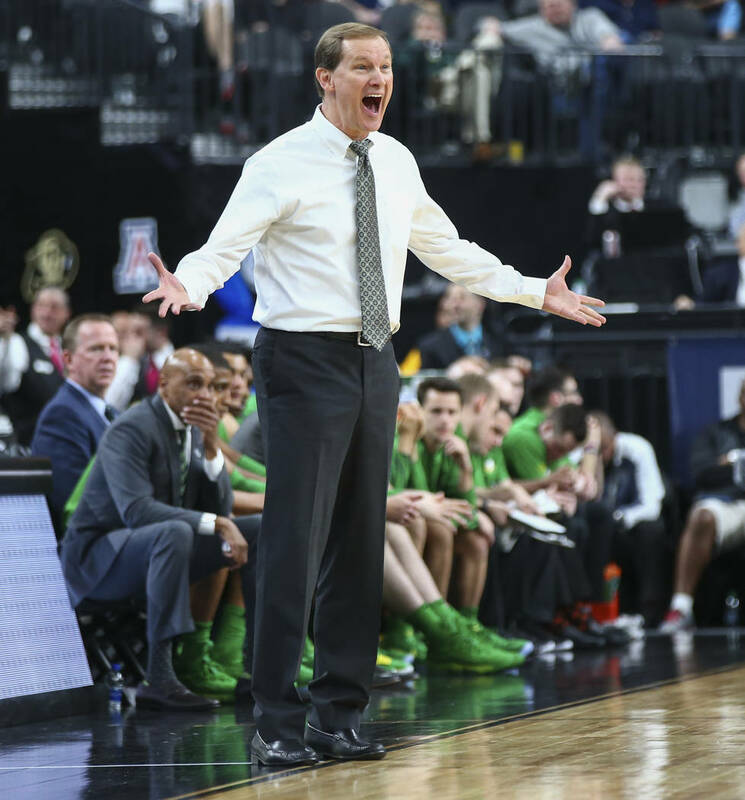 The Bruins will play top-seeded Arizona Friday in the semifinals. Holiday flirted with a near triple-double with eight assists and seven rebounds. It’s the fourth time in five years UCLA advances to the semifinals. 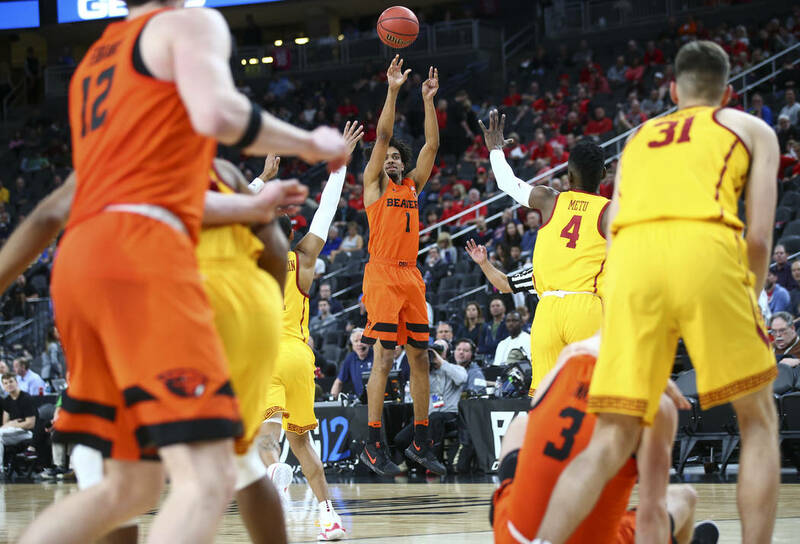 UCLA’s win means its Walton time at T-Mobile Arena, as eccentric announcer and former NBA star Bill Walton is in the arena and ready to call the next game in the tournament between Oregon State and Southern California. 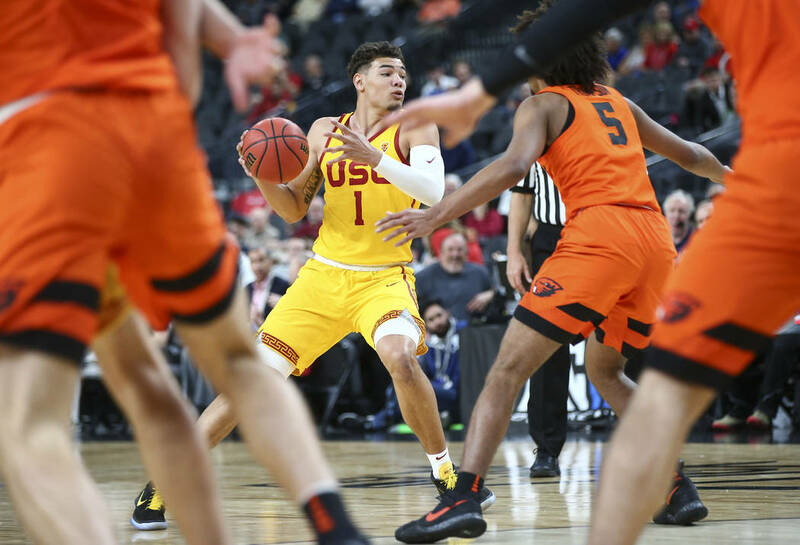 Trey Kell scored 16 points to lead No. 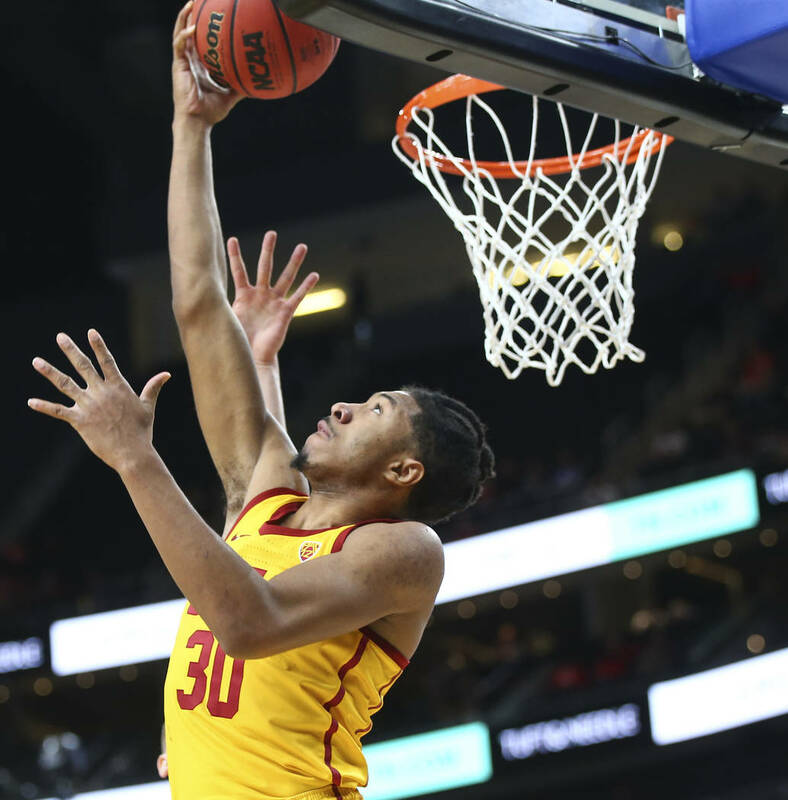 5 San Diego State (20-10) to a 64-52 victory over No. 4 Fresno State (21-11) in a Mountain West tournament men’s quarterfinal at the Thomas & Mack Center. Bryson Williams topped all Fresno State scorers with 23 points, and he grabbed nine rebounds. The Aztecs next play top-seeded and 22nd-ranked UNR (27-6) in a semifinal at 6 p.m. Friday. San Diego State closed the regular season with a 79-74 victory over the Wolf Pack. 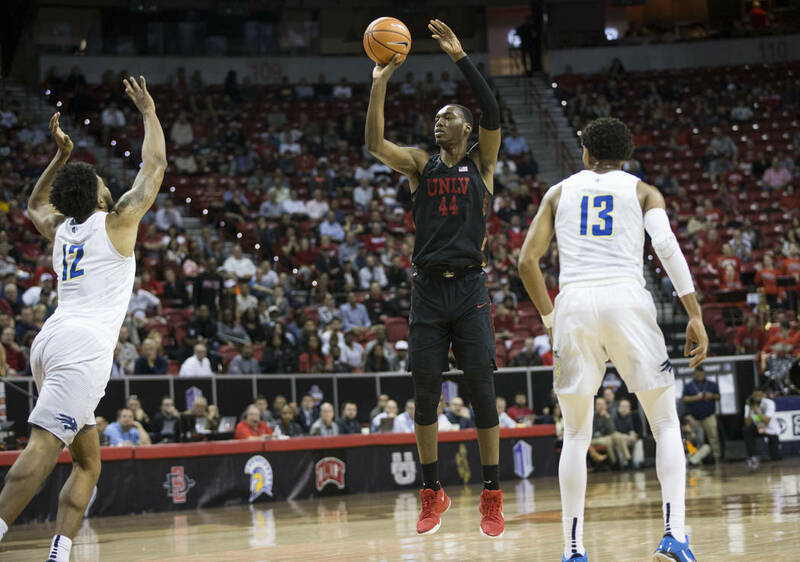 UNLV freshman forward Brandon McCoy said he hadn’t made any decisions about whether he will go pro early. It’s been widely speculated he will leave after one season for the NBA. “I don’t know yet,” McCoy said. 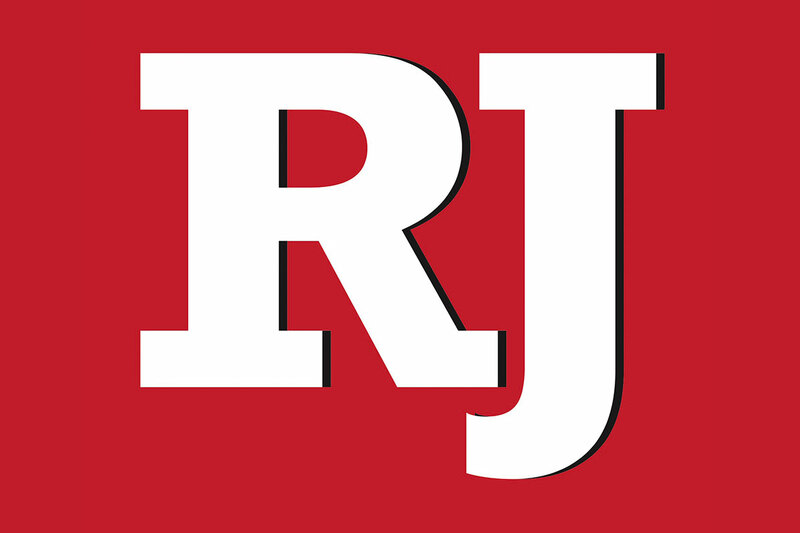 UNLV coach Marvin Menzies called his final timeout with 9:52 left as UNR was threatening to pull away in its 79-74 quarterfinal victory over the Rebels. UNR players Jordan Caroline and Kendall Stephens were asked after defeating UNLV 79-74 in a Mountain West quarterfinal if they would rather play San Diego State next. The Aztecs beat UNR 79-74 in the regular-season finale. San Diego State had to defeat Fresno State in the game following UNR’s victory over the Rebels for there even to be a rematch, so Wolf Pack coach Eric Musselman asked his players not to answer the question. But Stephens couldn’t help himself. 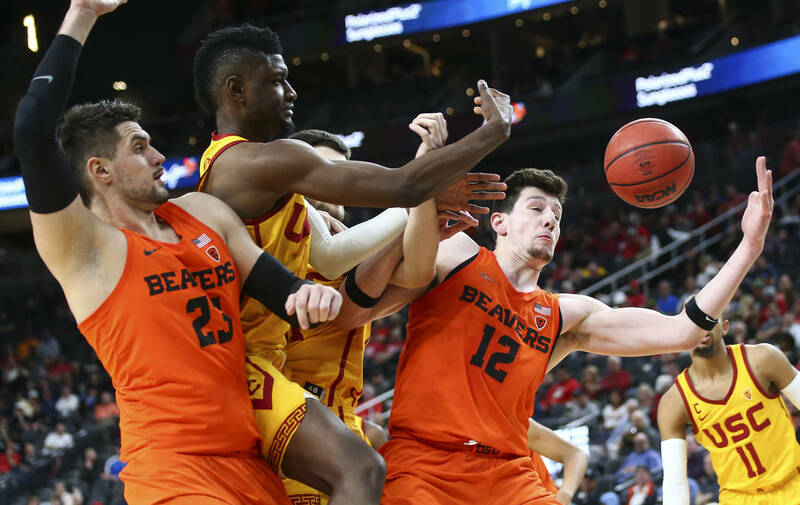 “I’d like to play San Diego State, almost for revenge,” Stephens said Musselman grimaced nearby. 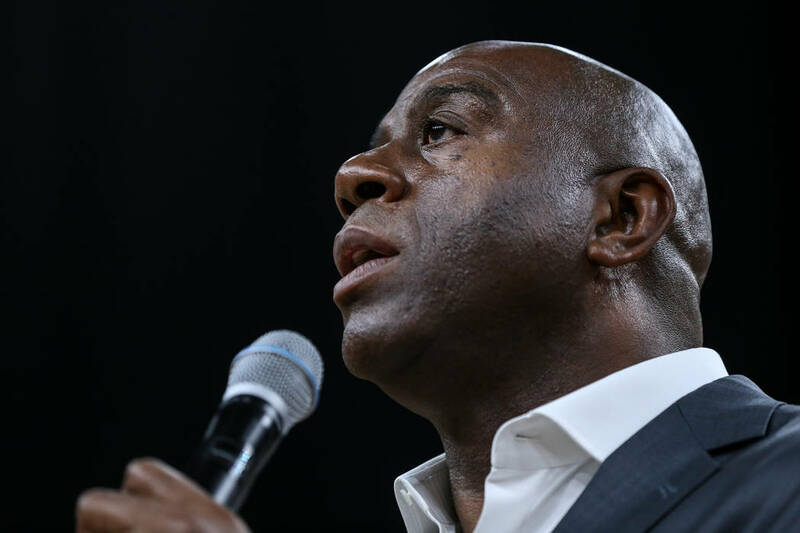 Los Angeles Lakers president of basketball operations Magic Johnson was doing some in-person scouting at the Pac-12 tournament Thursday. Johnson, a former Lakers star and NBA Hall of Famer, was sitting courtside next to Pac-12 commissioner Larry Scott and Los Angels Rams Executive Vice President of Football Operations/COO Kevin Demoff watching UCLA play Stanford. Johnson is still in his first year running the Lakers front office but the team already has more wins this season (29) than it did all of last season (26). WAC freshman of the year Allessandro Lever scored 29 points and Oscar Frayer added 13 and 15 rebounds to help No. 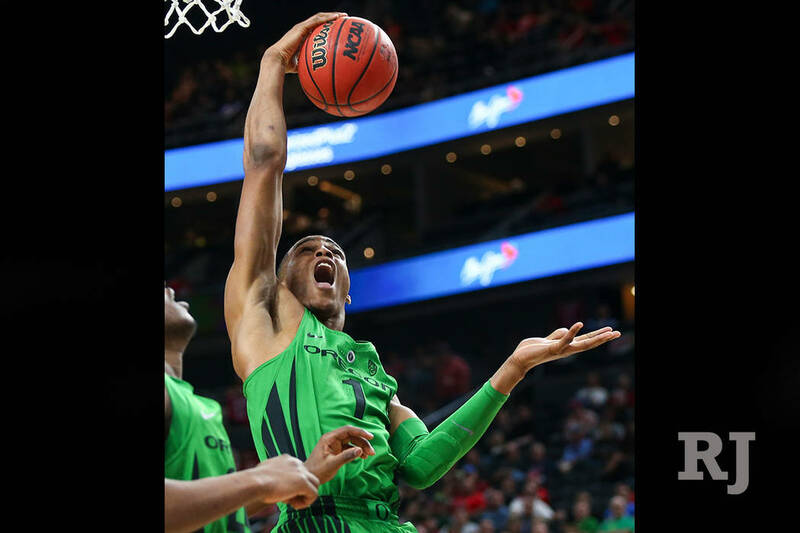 3 seed Grand Canyon University hold off sixth-seeded University of Missouri-Kansas City 77-74 in the opening game of the WAC men’s tournament Thursday at Orleans Arena. 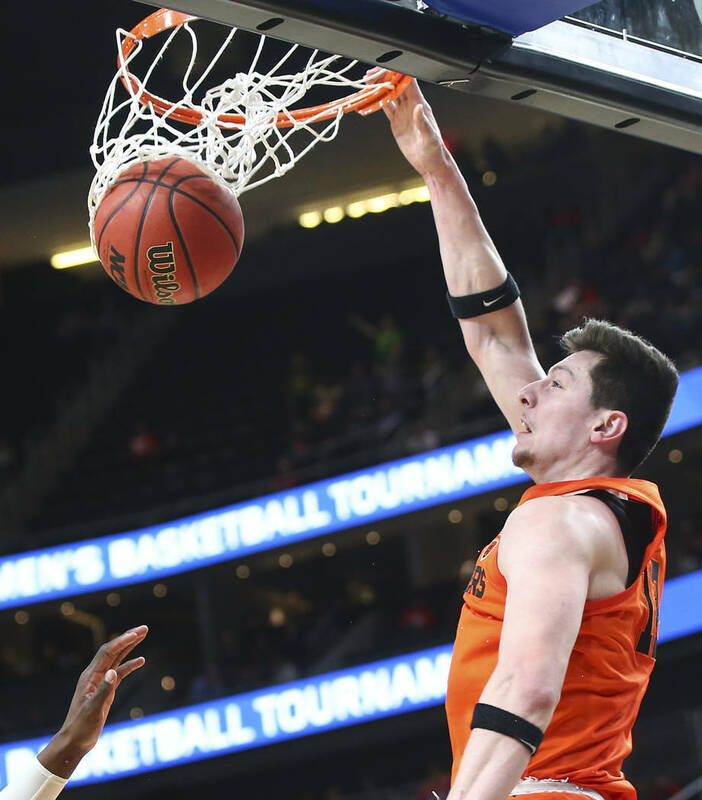 The victory was the first for Grand Canyon (22-10) in an NCAA Division I conference tournament game after a three-year transition period from Division II. The Kangaroos, who were led by Isaiah Ross with 18 points and Brandon McKissic with 17 points, finished the season 10-22. UMKC took a 20-4 lead in the game’s first six minutes. But Grand Canyon slowly chipped away and took their first lead at 48-46 just over five into the second half. After falling behind by as much as five points with 10:08 to play, UMKC retook the lead with a 13-3 run. GCU regained the lead at 72-71 with 1:42 to play on Casey Benson’s two free throws. Lever sealed the victory with a putback of his own miss with 54 seconds left. UMKC’s Broderick Robinson missed a three-pointer that would have tied the game with six seconds left. Canyon advanced to play the winner of Thursday’s second afternoon game, No. 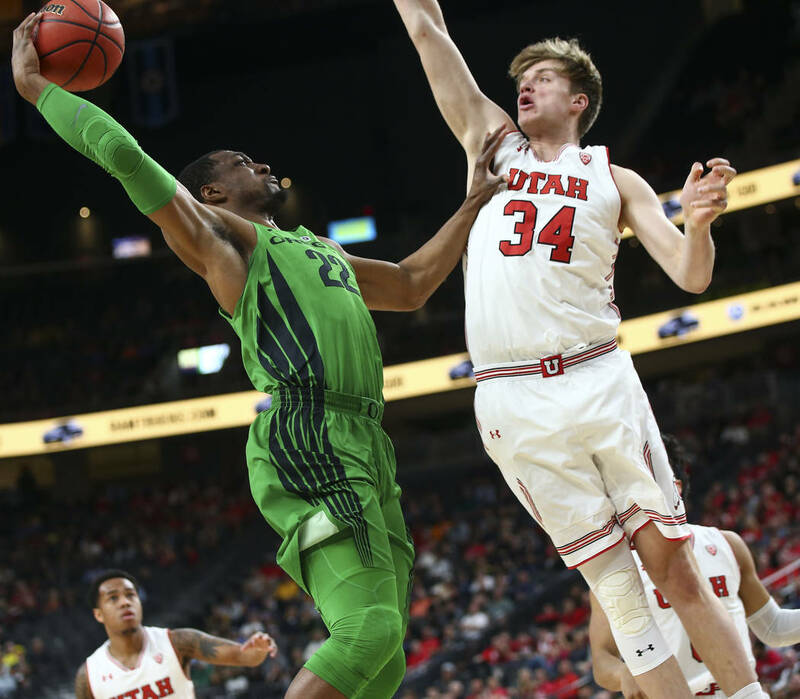 2 Utah Valley vs. No. 7 CSU Bakersfield, at 6 p.m. Friday. 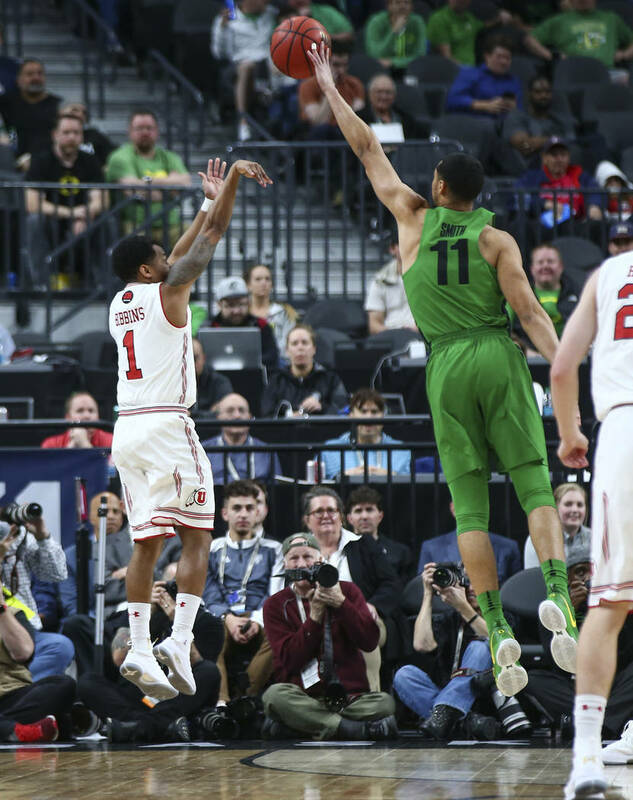 Arizona went on a big run midway through the second half to cruise to a 83-67 victory against Colorado at T-Mobile Arena in the quarterfinals of the Pac-12 tournament. The Wildcats’ 14-0 run gave them a 58-41 lead as last year’s tournament champions moved on to Friday’s semifinals. Arizona, the No. 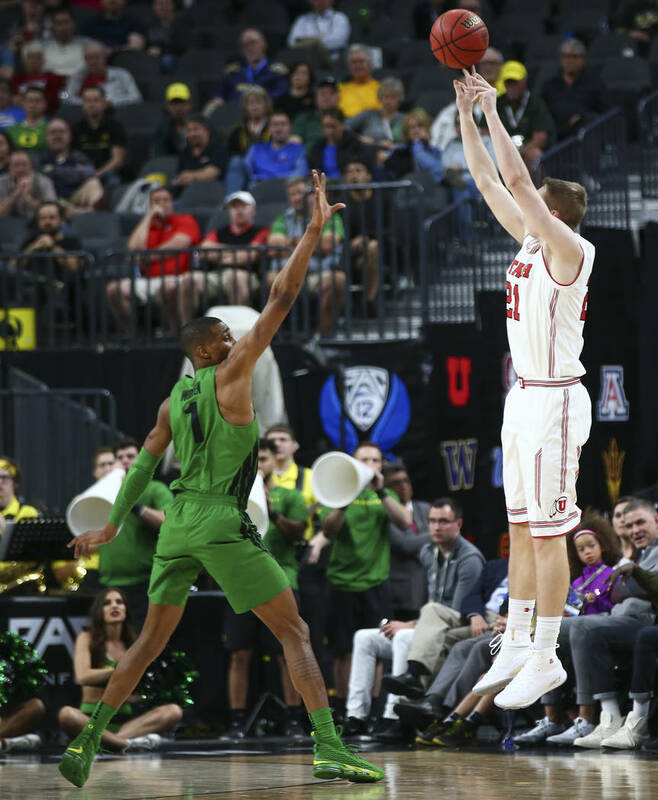 1 seed, will play the winner of the UCLA-Stanford game at 2:30 p.m.
Senior center Dusan Ristic gave the Arizona fans plenty to cheer about with his 16-point performance along with 11 rebounds. 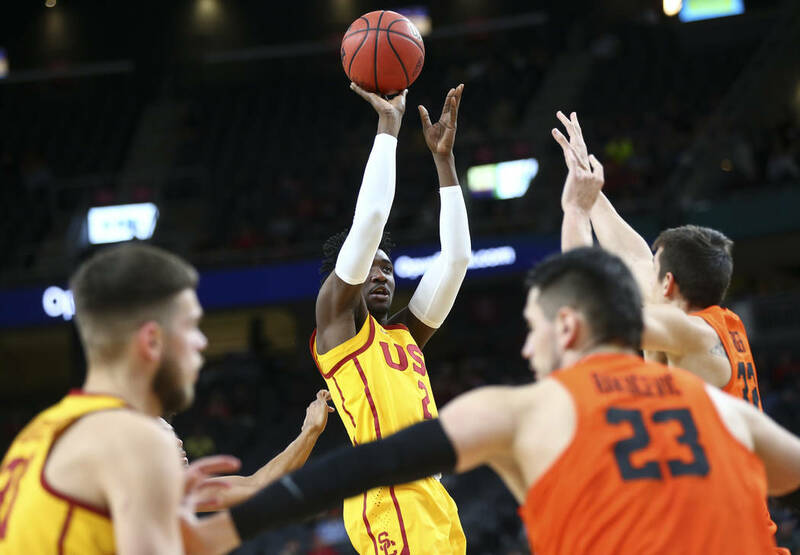 Freshman star Deandre Ayton didn’t have his best game but still contributed 10 points and six rebounds. 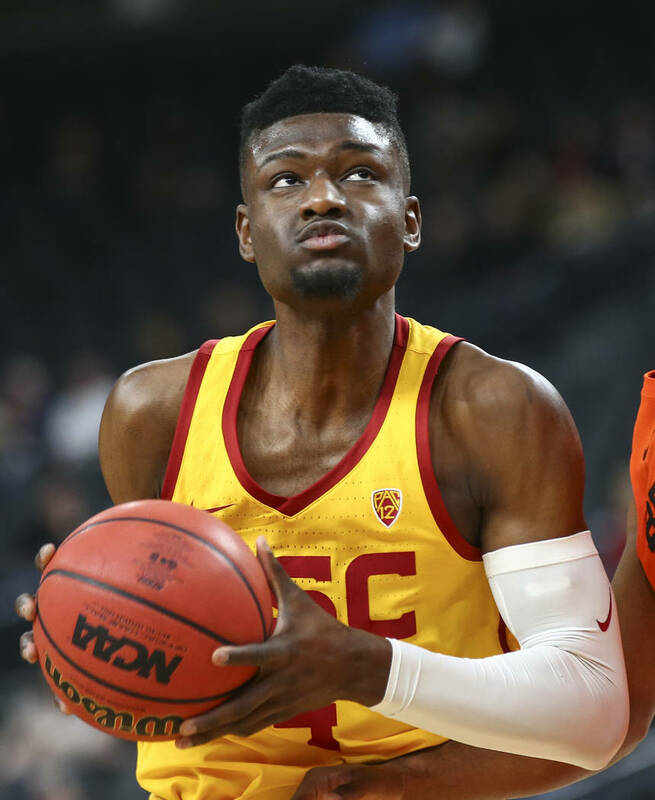 Ayton is projected by many to be the No. 1 pick in June’s NBA draft. Las Vegan Tyler Bey had seven points and nine rebounds for Colorado. 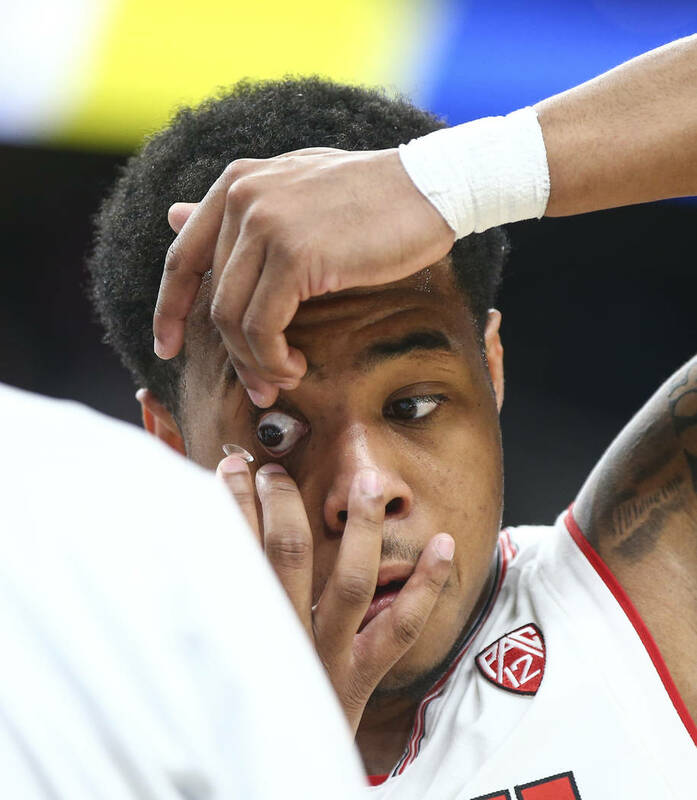 UNLV had it rolling early in the second half, taking a 12-point lead on its big rival, UNR. 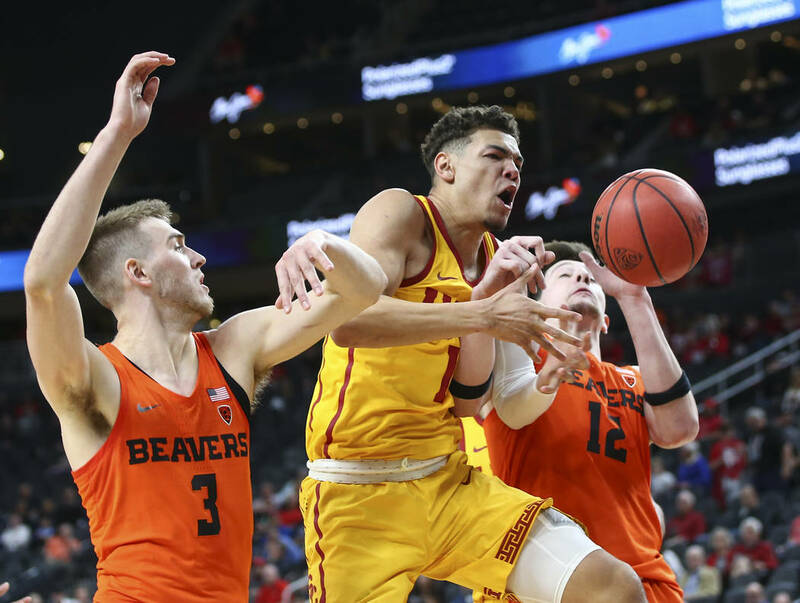 But the Rebels would soon face a situation with both starting guards with four fouls and basketball coach Marvin Menzies having to use all of his timeouts. 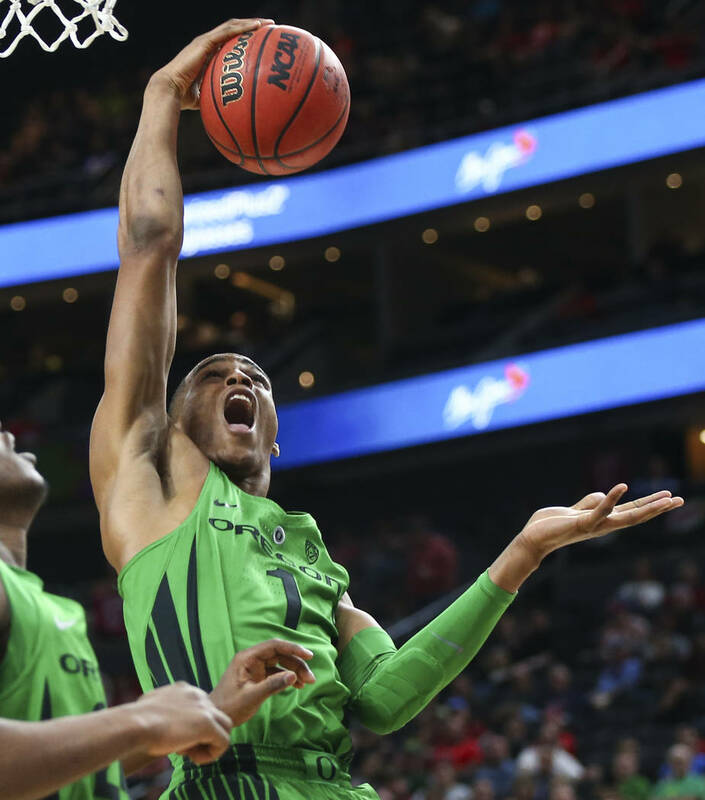 The eighth-seeded Rebels hung tough, but with a chance to tie the game, Jovan Mooring badly missed a 3-point shot with six seconds remaining, and the 22nd-ranked Wolf Pack won 79-74. 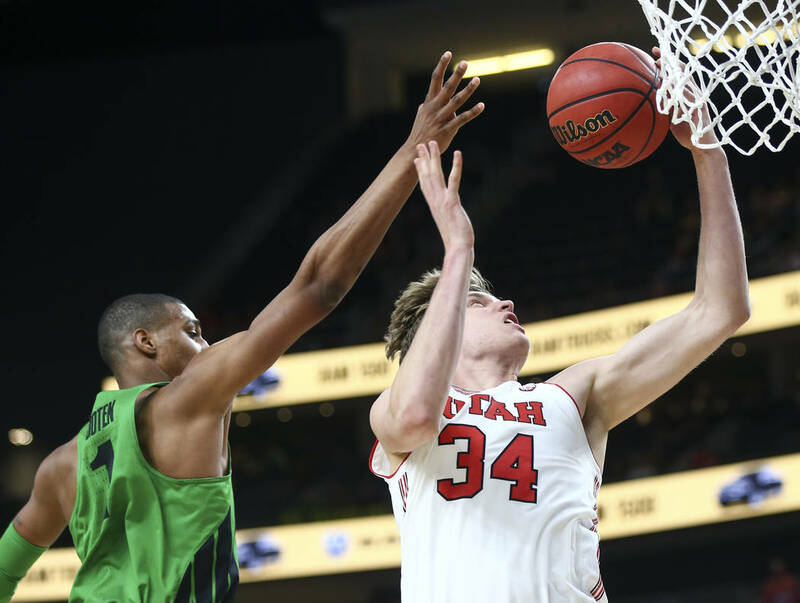 The loss in the quarterfinals of the Mountain West men’s basketball tournament likely ended UNLV’s season at 20-13. The Rebels aren’t expected to get a bid to the National Invitation Tournament and are almost certain to turn down an offer from another tournament, should one come their way. Remember when UNLV fans referred to him as “Midnight Lute? Today he’s “High Noon” Lute. Lute Olson, who coached Arizona to the 1997 national championship, is sitting on the aisle about five rows up on the Arizona side — one of the Arizona sides — at T-Mobile Arena for the Pac-12 quarterfinals pitting the Wildcats against Colorado. It’s a good vantage point, but not quite as good as his seat on the bench when Miles Simon and that bunch were hooping it up against Kentucky at the RCA Dome in Indianapolis. The champ is in the building. Super Bowl MVP Nick Foles was spotted at T-Mobile Arena at halftime of his alma mater Arizona’s game against Colorado. Foles, who threw for 373 yards and three touchdown in the Philadelphia Eagles’ 41-33 win over the New England Patriots on Feb. 4, was a three-year starter with the Wildcats before being taken in the third round of the 2012 NFL draft. In his final season at Arizona he led the Pac-12 Conference with 352.58 yards of total offense per game. The Wildcats led the Buffalo 35-33 at the half. 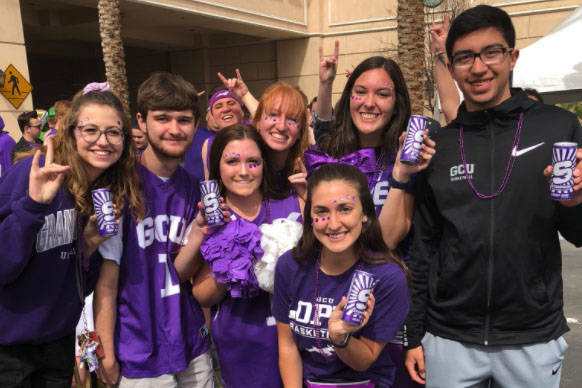 Grand Canyon University played in its first NCAA Division I conference tournament game Thursday in the WAC event at the Orleans Arena. 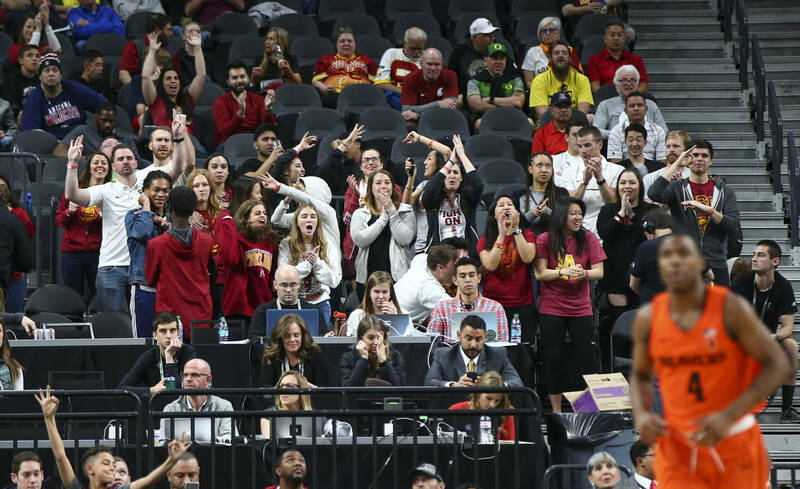 The Antelopes, in only their fourth year in Division I, are known for packing their home gym with student cheering section known as the “Havocs,” thousands. 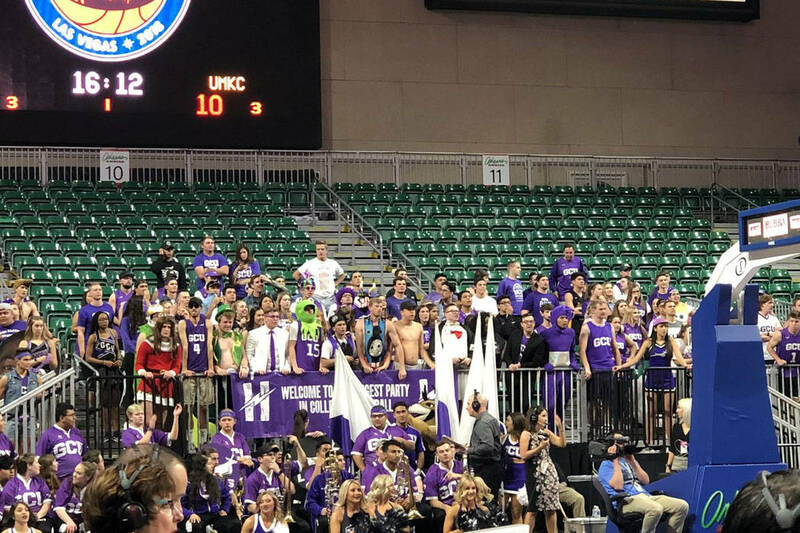 The Havocs crowd wasn’t that big for Thursday’s opening against Missouri-Kansas City. However, there were a couple hundred of those Havocs in the north end zone, along with the band and the full cheering squad. And they were loud. GCU had the biggest fan following, but the Lopes were having trouble getting going. They trailed 18-4 five minutes into the quarterfinal. Colorado’s Tad Boyle is coaching hurt. 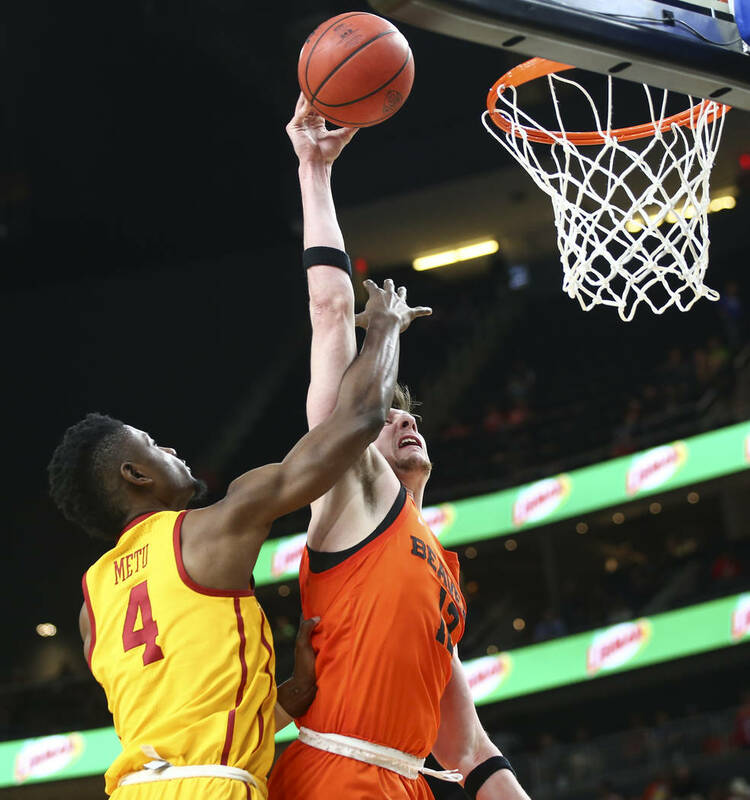 Boyle was still in a boot and walking with a limp Thursday after injuring his right calf breaking up a late-game skirmish between his players and Arizona State on Wednesday. Boyle said after the game a team doctor told him he either tore or strained his calf. 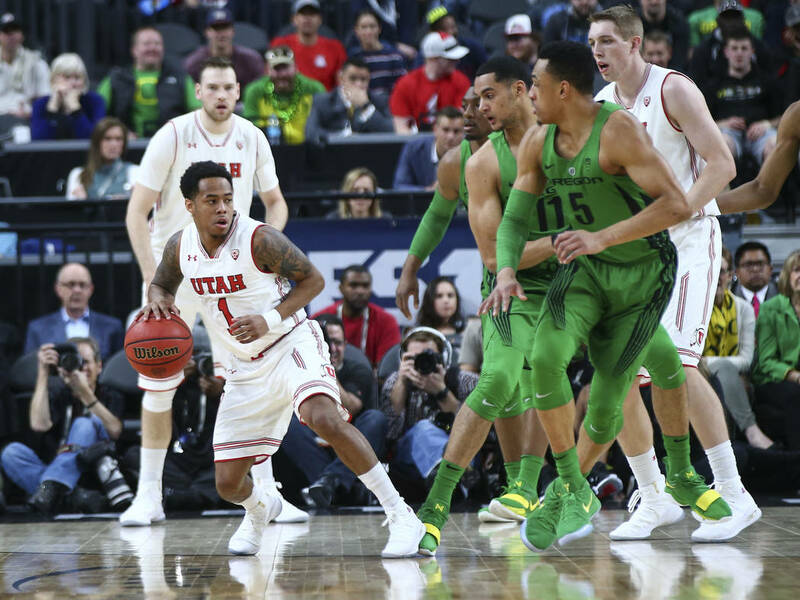 He still returned to T-Mobile Arena the next day, boot and all, when his team played against Pac-12 tournament No. 1 seed Arizona at noon. Arizona fans have arrived in Las Vegas, and they are salty. 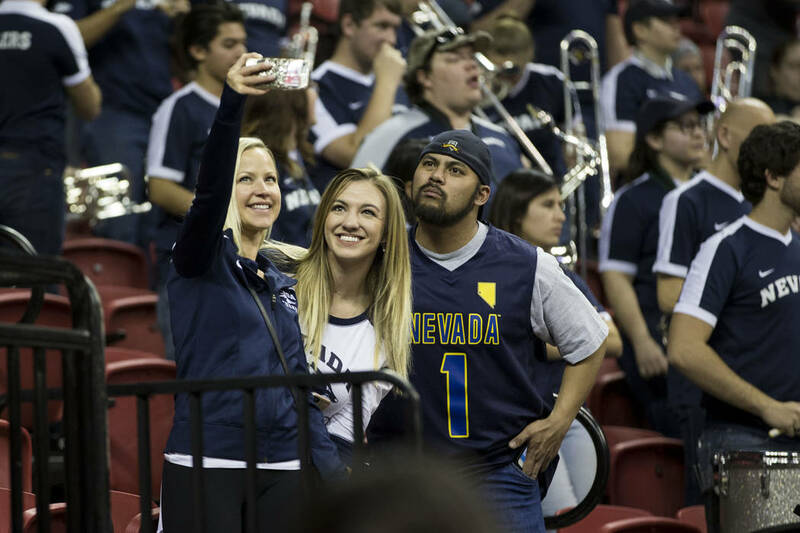 A group of Wildcats fans were wearing shirts that said “FAKE NEWS,” with the school’s logo forming the “A,” outside T-Mobile Arena before the team’s first Pac-12 tournament game against Colorado at noon. 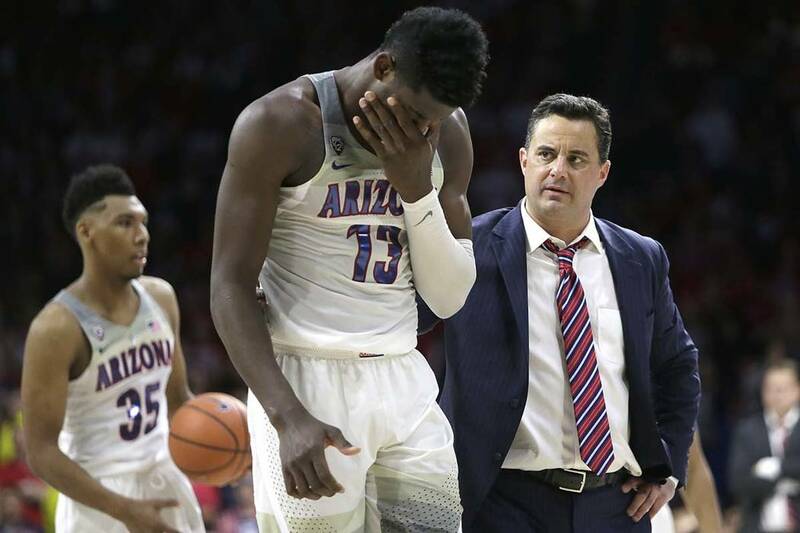 The program recently made headlines when ESPN reported on Feb. 23 that Arizona coach Sean Miller was caught on an FBI wiretap with agent Christian Dawkins discussing payment of $100,000 to ensure the signing of now Wildcats freshman phenom Deandre Ayton. Miller sat out a game after the report, but later held a press conference disputing the claims. If Arizona fans outerwear is any indication, they’re siding with their coach on this one. Your school’s president posts a message congratualting the debate team on his Twitter account, which is what UNLV president Len Jessup did after the Rebels struggled to beat Air Force in their Mountain West tournament opener and the Lady Rebels were eliminated by UNR. Who knew UNLV had a debate team? And that it was pretty good?